The bathroom makeover concludes today with a little light fixture fix. There was nothing really wrong with the original light fixture in my daughter's bathroom, not too outdated yet. But she loves mason jar light fixtures and I knew she would be thrilled to have one. I looked at a few tutorials like this one to help. It is very easy to do! I started by tracing around the top of the globes that were on the fixture. Then I drilled a few holes in the lid--just enough to be able to get my scissors in there to cut. I used just regular, household scissors--they cut easily. I put the lid and ring back on the light fixture and then screwed on the original ring. The jars I used are some that I accidentally bought for canning, 1 & 1/2 quart size (these did have applesauce in them that we have already eaten). I liked the size for this project. I wanted them to have a tint to them so I used this Martha Stewart transparent glass paint purchased at Michaels. When the paint was dry, I screwed in the light bulbs and then the jars. I am not thrilled with the spiral, fluorescent light bulbs in them, but daughter likes them and I am not sure if the Edison bulbs will give off enough light for a bathroom. I could have painted the actual fixture to update it more, but the rest of the bathroom still has the brushed nickel so we are sticking with that for now. My daughter collects mason jars too, she loves to put sand in them from different places we visit. The paint cost $3 so the grand total for this bathroom is $62! I do still need to buy her a couple new hand towels so that is how I will spend the extra $13 I have left--well maybe $7-8 on the towels and the rest on a latte for me. 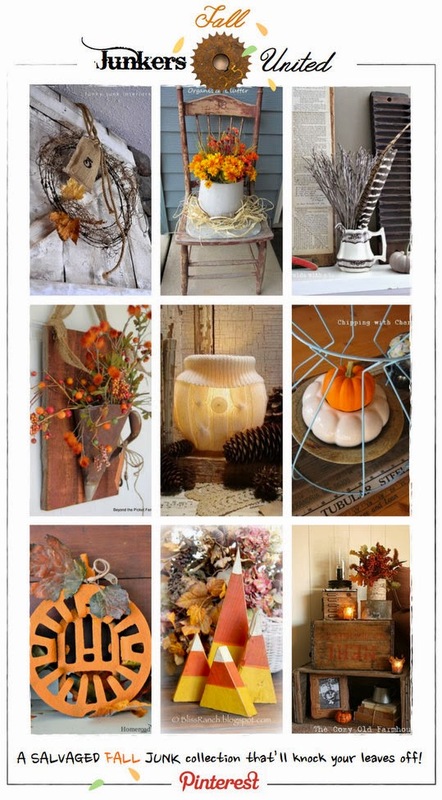 Fall Junkers Unite With 5 Ways to Use Junk in Your Fall Decor, a Pin Board, & a Link Up! Happy Fall Fellow Junkers! Junkers United all had so much fun at our last get together that we decided to do it again! 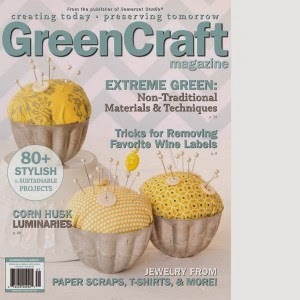 We have teamed up this time to bring you simple, fabulous, fall junking projects, plus more! For those of you who are new here, welcome! 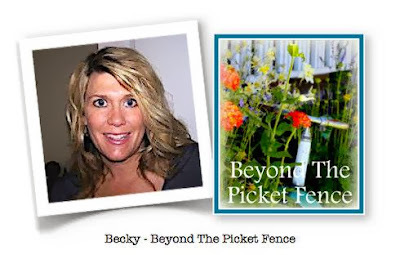 I am Becky, author of Beyond The Picket Fence. 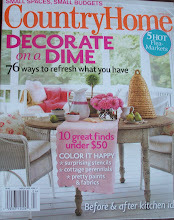 I love to take discarded items, thrift store finds, and reclaimed wood and transform them into "needful" home decor items for the "country chic" home. You can see many of my projects here on my blog and can also follow along via Facebook and Pinterest. Settle in under your favorite cozy blanket and take some time to check out all the falltastic links! 1. Use junk to create height in your decor. I used a child's chair saved from an old school in this vignette to add vertical interest. You can incorporate a stack of old suitcases, a small table, or an overturned rusty bucket to create height in your displays. 2. Reclaimed wood adds texture and warmth to your fall displays. Three pieces of barnwood propped on my shelf create a lovely backdrop. Don't have barnwood? 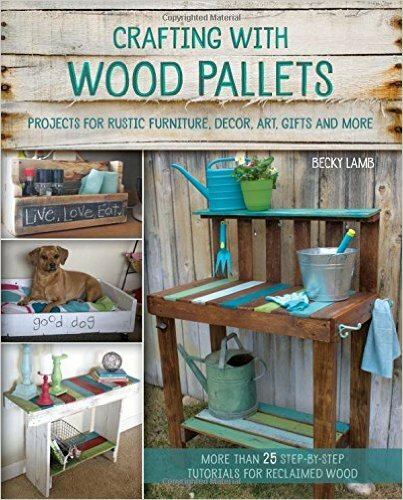 An old pallet would serve the same purpose, plus the backside will give you little shelves to set items on. 3. Rust is a must and the perfect color for fall. A rusty stove cover and rusty urn are perfect touches for my fall arrangement. 4. Old books contribute so much to any display. These too can help add height and are the perfect place to set objects of interest. Pick colors that work with your style and the season. 5. Remember to use nature's "junk". Natural touches bring a wonderful organic feel to any decor. I utilized some deer horn sheds, a pine cone, driftwood, and some fall leaves (Find out how to preserve fall leaves HERE.). Look around your home today and find fun junk to create unique and beautiful fall decor! We junkers have been on pinning frenzy--pinning the best fall junk out there. Check out our Fall Junkers United board HERE. Each of these talented ladies has created a new, fall junky project for you to enjoy. So hurry up and get clicking on the links below! Have plain, boring, builder mirrors? Me too, and I know there are products to change that, but I decided to do my own cheaper version. and Command adhesive picture hanging strips were all it took. I stuck the trim/command strips directly to the mirror. They are holding well!! I could have mitered the corners, but because I chose to use four different types of trim boards and because I wanted a more shabby look, I did not. The silver mirror was in the bathroom before--daughter wanted it back in there. It is not really useable hanging in this spot, but reflects the natural light well. Which brings the grand total so far to $59, and that leaves me $16 left to spend. 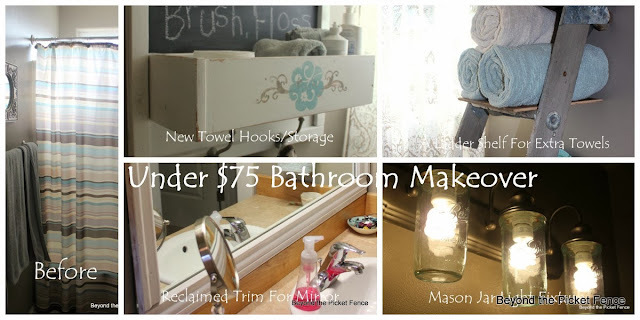 I have one more project to show you to complete the under $75 bathroom makeover. It will have to wait until the end of the week, I have something fun for you all coming up tomorrow evening so make sure to check back in! The bathroom makeover continues. If you missed my last post on the bathroom makeover and the before picture click here. My daughter's bathroom does not have a linen closet and the cupboard under her sink is full with girlie things. We needed a place for extra towels and a ladder shelf was the answer. This is the top portion of the ladder I used for this tall ladder shelf. The lovely grey patina is perfect for this bathroom. I added a wider shelf, using a stray picnic basket lid. I like knowing and showing this shelf was something else so I left the elastic silverware holder and put the lid hinge holes at the front of the shelf. D rings attached to the back of the top ladder step hangs the shelf. A $1 thrift store plate and a black and white of my daughter at her princess vanity when she was three adds a little color to this spot. The top of the shelf holds a flicker candle in an old jello mold and extra washcloths. I love the juxtaposition of the rustic shelf with the white feminine shower curtain. Total cost for this project: $1 and the brings the running total thus far to $45--I have $30 more to spend! Want to freshen up your bathroom for under $75? With some smart shopping and DIY projects you can! Over the next week or so I will show you how, starting with this new place to hang towels and keep bathroom necessities. Here is a before picture of my daughter's bathroom. It was fine, we just had not changed it in about 6 or so years and were ready for something new. This fun bathroom organizer was inspired by a similar one at Makely School For Girls. I decided to start with a drawer I had in the garage. If you don't have a drawer you could use a window planter box, a CD tower turned on its side, or build an easy box. I am using what I have to save money. I did not have one piece of wood the size I wanted so I used two. Remember to make the piece large enough to cover up old towel rack holes, this one is 26" wide. I wanted trim around it--I used some 1x2's I had. I attached the trim boards with a brad nailer. You could use screws or nails as well. Next, I attached the drawer with screws. Because of the drawer front, the drawer did not lie flat. I used a couple pieces of thin masonite between the drawer and the back to solve this problem. The drawer covers the seam where my two pieces of plywood meet. I made sure screws went into both pieces of the plywood. After a light sanding, I painted it white. I cut out a stencil with my Cricut that somewhat matched the new shower curtain we picked up at TJ Maxx for $15. We were going to put a quote on the top part, but couldn't decide on one, so decided to go with the chalkboard paint. My daughter loves writing verses and quotes on the chalkboard in her room, so she is excited to have another place to write. I painted some $3 hooks for the new towels I also purchased from TJ's on clearance for $7 each. and the hooks will assure towels get hung up! That means I have $31 left in the budget--wait until you see how I stretch that!